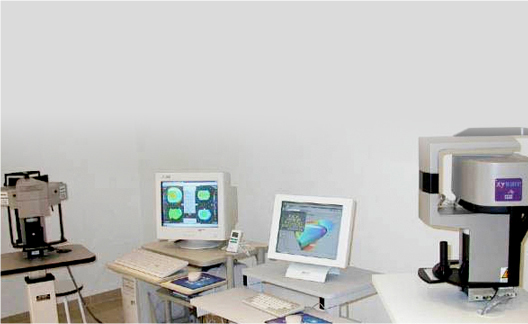 The system “ZYOPTIX-Z100 of ‘Bausch & Lomb’ and the microkeratome ZYOPTIX-XP” available at the clinic, is an advanced and improved form of Excimer Laser and LASIK treatment called personalized Lasik, it has a Wavefront system secures the treatment and operate more precisely the vision defects. Zyoptix Z100 and its associated technologies are to date the eye treatment systems most secure on the market. From the first data acquisition, the system identifies you and not only recognizes your iris but also scleral environment by determining the left and right eyes. Thus, it is impossible to mix data from different patients or to treat a patient with the wrong settings, the system refused to function. At any time, the system identifies you personally. The iris of the eye is, like fingerprints, unique. Analyzed and submissions by the Dual Station, its characteristics are submitted as an image laser. The iris recognition system Zy-Id makes the operation impossible if your eye is not recognized. If the camera does not recognize your iris, the operation will not begin. * A laser beam diameter of 01mm allowing having pulses 1 and 2 mm which greatly improves the treatment accuracy. * The Zyoptix Z100 laser pulses are twice as fast as before, this result in a shorter processing time making them more predictable results. * Zyoptix Z100 laser preserves the cornea by removing 20 to 30% less corneal tissue: it is a less invasive technique and healthier for the eye. * Zyoptix Z100 laser is a great advantage especially for patients with thin corneas, large pupils more than the average and high order. * The laser is equipped with a multidimensional and faster eye tracking device for increased security. Once a movement of the eye is detected during the operation, the laser is interrupted thereby avoiding any deflection of the laser beam. * The correction achieved with the Zyoptix Z100 gives a corneal shape that is closer to that of a normal eye, thus improving vision during the day and night.